Four-color process printed on both sides of 100lb C2S White Gloss stock. 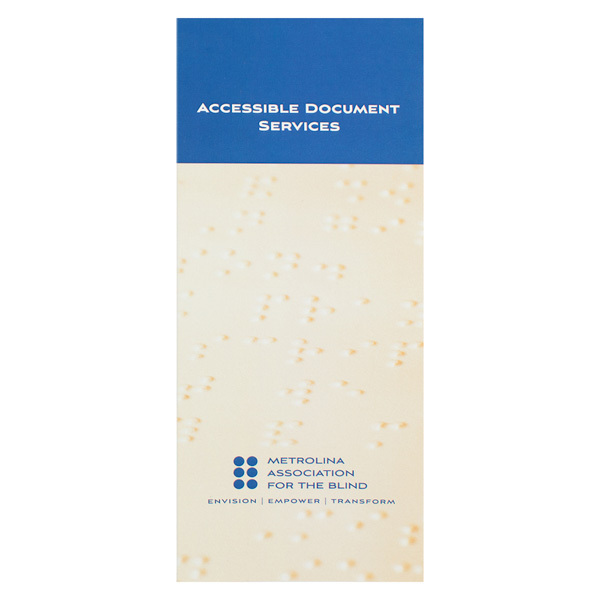 Metrolina Association for the Blind chose a simple design for their rack brochure. Beige and blue evoke secure and calm feelings, which fits well with the organization's goals. The sans serif font keeps the design clean and crisp. Clients can find information about the organization’s history, services and prices inside. Company contact information is on the back. 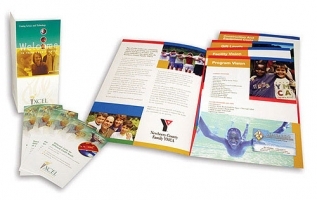 This 3 11/16" x 8 1/2" tri-fold brochure's layout lets you organize content to guide viewers through information in a logical sequence. Visible immediately on opening the cover, the right exterior panel lets you introduce important information before recipients view details printed on the three interior panels. Digital four-color process printing delivers crisp images and wide color variety for a stunning design. Portrait orientation is the most popular style for this item, as it fits easily into literature racks, 4" x 9" presentation folders, or brochure slits in standard 9" x 12" folders. Dimension Closed: 3 11/16" x 8 1/2"
Dimension Open: 11" x 8 1/2"